The big news today is that Washingon got off the fence. Washington state, that is. 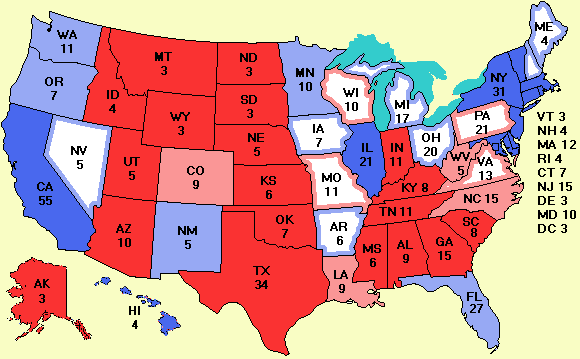 It had been tied for a while, but a new poll from Moore Informaion gives Kerry an 8-point lead there, increasing his electoral vote lead to 4 nationwide. A new poll in Iowa shows Kerry with a bigger lead there, but new polls in Maine and Missouri show the trend going for Bush. Several changes have been made to the Excel spreadsheet today on request of readers of this site. First, a new column as been added for recording states that are tied. This situation has occured twice recently, in New Hampshire and Washington. Also, the column order has been changed so that for columns G through M, the farther left a number is, the better it is for Kerry. Similarly, the farther right a number is, the better it is for Bush. A national Zogby poll taken after Edwards was selected as Kerry's running mate shows a 2-point increase for the Demcrats, who now lead in the popular vote 48 to 46.